eWAVE2108H is a cost effective, 1 RU mini-chassis and multi-service WDM transmission platform which provides 8 wavelengths for point to point application, or 4 wavelengths ring application per device, more wavelengths application is possible by stacking multiple boxes at each location. 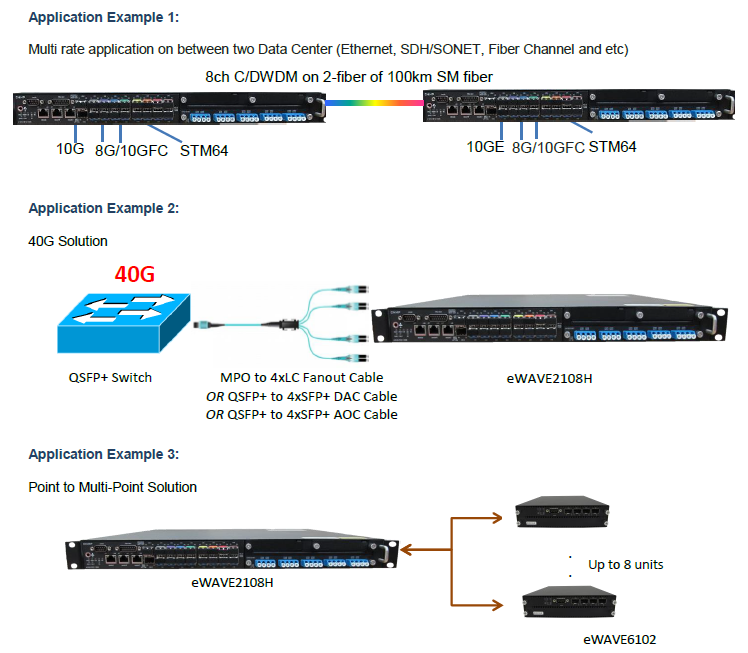 eWAVE2108H channel capacity can be pluggable by customer by simply using SFP+. Each channel port supports bit rate of 10Gb/s. FEC is used to improve transmission performance. It supports 1+1 optical channel and optical line protection. It’s stackable for future expansion. eWAVE2108H compliant the standard of FCC, RoHS and VCCI. In Star topology application, it can be used as HUB to communicate with eight remote 10G media-converters, It can provide in-band management via FEC to each remote media-converter. The system is employed with standard-based management protocols such as Graphic User Interfaces (GUI), CLI and SNMP. These can be accessed either though RS232 or Telnet via TCP/IP. User can configure and monitor the system remotely. This also allows eWAVE2108H to be easily integrated into existing EMS system as a plug-in network element. 40G signal can be transmit over eWAVE2108H by using MPO-4LC patch cords. It’s convert the QSFP+ interfaces to four 10 GE interfaces when connecting to a SFP+ port. This solution is ideally suited to metro infrastructure, enterprise, and carrier-managed services applications.